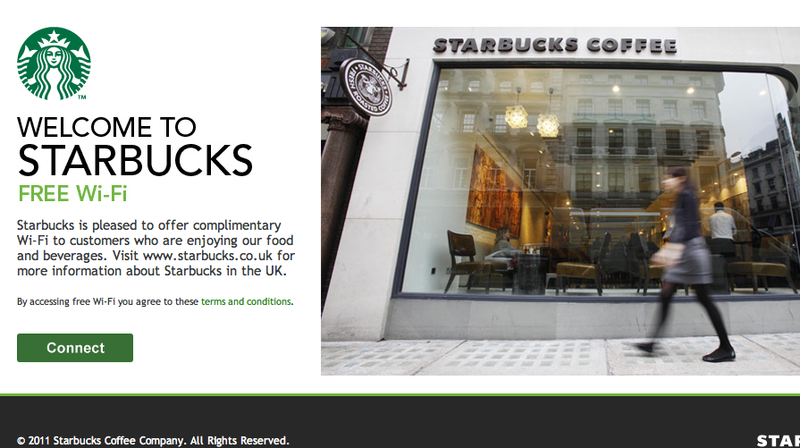 Last year, Starbucks rolled out free WiFi in its US coffeeshops, and today it’s been extended to the UK. Whereas previously, a Starbucks card and a log-in was required for free WiFi access, from today anyone can jump on the chain’s network freely. Starbucks confirmed the move in a tweet today, saying that hundreds of its locations were covered by the move, so this isn’t a complete country-wide rollout as yet. (Update: A press release just sent out confirms that 650 locations are currently covered). However, there’s no news yet about the content partnerships which were launched on the same day as free WiFi in the US. There, free access to otherwise paywalled or chargeable content from the likes of iTunes, The New York Times, Patch, USA TODAY, The Wall Street Journal, Yahoo! and ZAGAT was bundled with Starbucks Internet connections. Still, this is a good move for UK customers of the global chain, and this post is brought to you by the very free Wifi we’re reporting on. The WiFi’s unsecured though, so remember to log in to websites using an HTTPS connection if you can to avoid people snooping on your data.